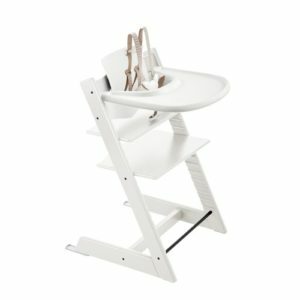 The Stokke Tripp Trapp high chair is one of the many coveted items on baby registries these days. This iconic high chair was invented by a Norwegian industrial designer Peter Opsvik in 1972 and was the first of its kind on the market. The Tripp Trapp chair has a simple, sleek Scandinavian design and is made of solid European beechwood. An early Tripp Trapp development sketch by Peter Opsvik. Opsvik intelligently designed the chair to be able to grow with the child. By maneuvering the seat and foot rest up and down the slats of the chair, it is able to provide a comfortable, ergonomic seat at any age. 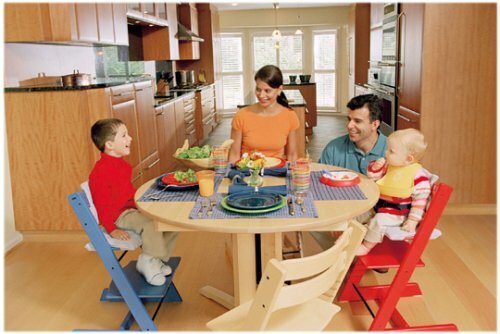 The Tripp Trapp was also made to fit right up to your dining table, encouraging children to interact alongside the rest of the family during meal times. Although the overall aesthetics of the chair have not drastically changed since Opsvik’s original design in the 1970’s, over time Stokke has made slight improvements to the chair. They’ve removed and added different safety features as well as accessory parts. 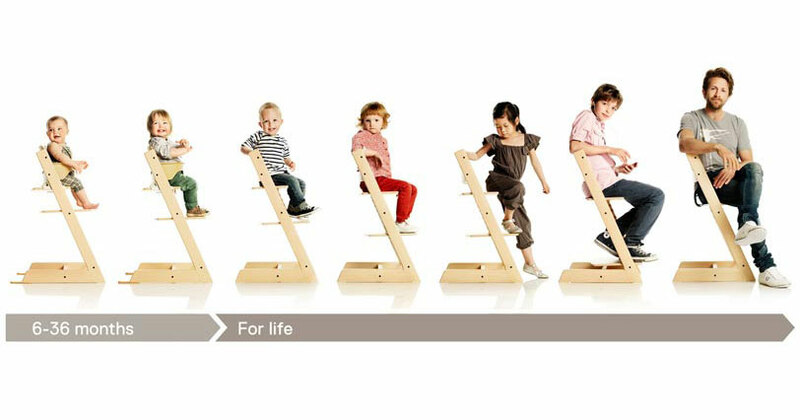 Here is a quick reference guide to better understand the history of the Stokke Tripp Trapp chair and how the models have changed over the years. These chairs were always marketed in Europe as Tripp Trapp chairs. However, in the US before 2006 the chairs were called “KinderZeats”. The KinderZeat was sold for use with children 18 months and older. The original design of the chair was intended to pull right up to a dining table so the child could eat with the rest of the family. Since, the chair was not intended for use with infants, but for toddlers and older children, the only accessories that were used with this chair were a 3-point harness and seat cushions. 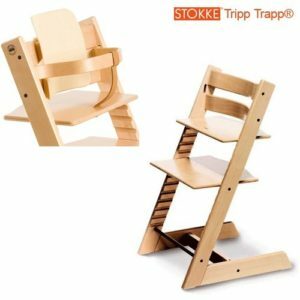 During this period the chair went through a rebranding process in the US and the name was changed to Tripp Trapp to be consistent with Stokke’s European marketing. To be more competitive in the US market and to pass new US safety standards Stokke introduced a new 5-point harness, and a baby rail attachment. With the new baby rail system these chairs could now be used with infants starting at 6 months, a feature many Americans desired. 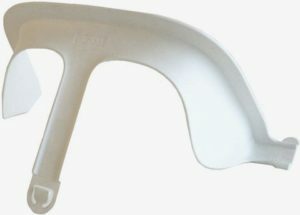 The white plastic baby rail attached to a white clip attachment that protruded slightly away from the base of the seat. However, after this attachment was released there were reports of the plastic cracking. Due to safety concerns the baby rail system was retired and a new design was later implemented for the baby attachment. 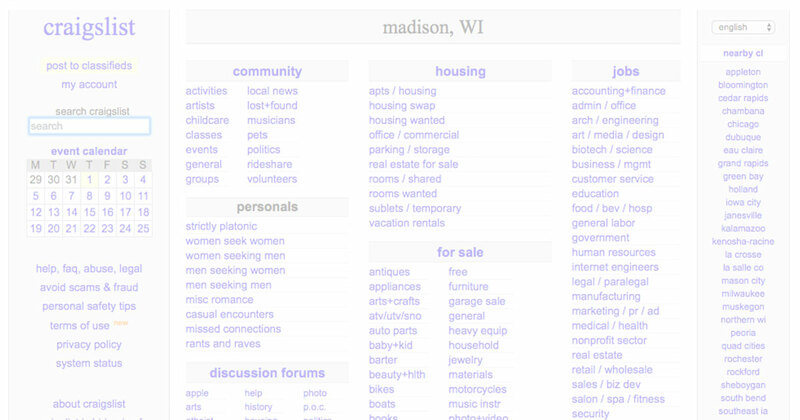 Chairs manufactured after 2008 are the models that are currently on the market today. The newer model was designed to address some of the US safety concerns with the previous versions. Due to reports of the chairs easily tipping backward Stokke added glider extenders to the feet of the chairs. This made it so if a child pressed back against the table they were seated at the chair would slide backward on the gliders instead of tipping over. Extended gliders on Tripp Trapp chair feet. They also redesigned the baby rail to what is currently known as the Baby Set. 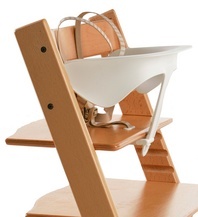 The Baby Set includes a back rest as well as a seat attachment that clips onto the chair. As with the previous model, by using the Baby Set attachment the chair can be used with children as young as 6 months. 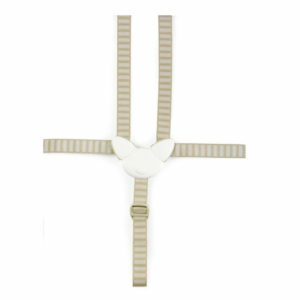 Baby Set attachment with 5-point harness. 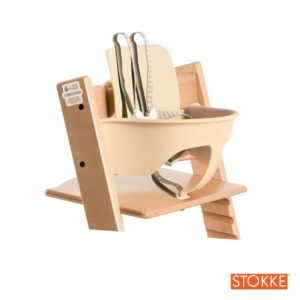 The models manufactured after 2008 are compatible with all the current accessories for sale on the Stokke website. These include the baby set, the tray, and seat cushions. Tripp Trapp with 5-point harness, baby set, and tray. 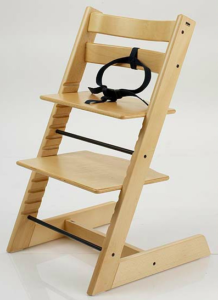 Due to differences in safety standards and regulations, European and US versions of the Tripp Trapp chair are slightly different. The European version of the Tripp Trapp chair has a wood rail that can be attached using grooves in the side rails of the chair. There is also a leather crotch strap that connects to the wood rail and attaches to the bottom of seat. If you decide to buy used and find a vintage Tripp Trapp chair in the US they are usually this type of European model.